The recent equity market air pocket turbulence has added a bit more comfort and confidence to my decision to devote a substantial part of my Canadian equity allocation to BMO's low volatility ETF (TSX symbol: ZLB). 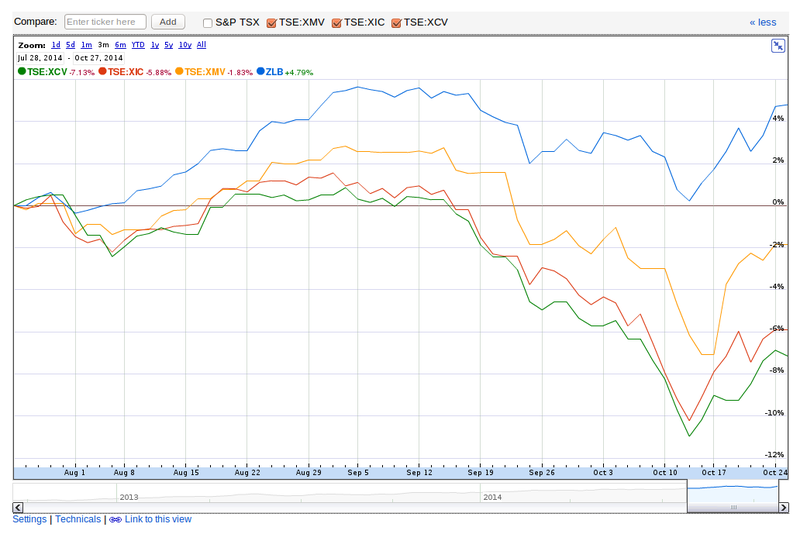 The Google Finance chart says it all - less than half the price drop in October compared to the broad market TSX Composite ETF from iShares (TSX: XIC). What correction? iShares' low vol ETF with symbol XMV also has a lower drawdown than XIC. I notice also that iShares' value ETF symbol XCV behaved just like XIC. That doesn't seem to offer much support to those who complain that low vol is just the value factor in disguise. Dave Dierking writing in Seeking Alpha found the same pattern in the USA with the SPLV ETF compared to the S&P 500 SPY fund.